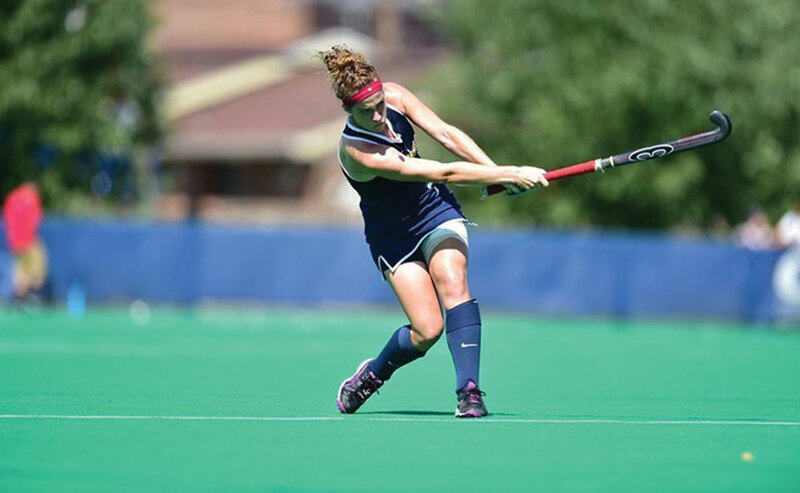 The Drexel University field hockey team had an eventful weekend. Not only did they win their final two games of the season against tough opponents, they were able to secure the fourth seed in the Colonial Athletic Association playoffs. Senior day was also this past weekend and as such the Dragons honored players Mary Lynam, Danielle Grassi, Jenna Knouse and Lauren Hibshman. Each of these seniors deserve to be recognized for their contributions to the team; their leadership helped propel this young team to a postseason appearance, where there is no doubt they will want to continue the successes of the season. Drexel faced No. 14 University of Delaware and Towson University this past weekend. Friday’s game was against the Blue Hens, who ended the regular season second in the CAA. This was clearly going to be a tough game, but Dragons knew it was important to play hard and do everything they could to win. The first half started extremely well, as Lauren Hibshman scored within the first 10 minutes. The goal came off of a penalty stroke, and would be the only goal scored in the half. Drexel locked in on defense and was able to neutralize Delaware’s attack. This fast start for the Dragons was exactly what the doctor ordered — Delaware is a team that can strike at any time, so a dominant first half was vital for the Dragon’s confidence. The second half was not as perfect as the first, but it was close. The Blue Hens scored quickly, but Drexel did not let that hurt their confidence. Tied at one for most of the second half, the Dragons finally found the back of the goal again with 13:23 left. Jessica McCarthy scored her fifth goal of the season, which was perhaps her biggest so far. The Dragons continued to stifle Delaware’s attack— they did not allow another goal and went on to win the game 2-1. Drexel certainly was able to stick together and fight to the end to win this game against Delaware. Drexel carried this strong effort into their next game against Towson. Towson ended the season just 2-16. Games like this, however, after coming off of an emotional and big win against Delaware, can make for an upsetting loss. The Dragons made sure not to let this happen. In the first half, defense was the name of the game—neither team was able to score. The Dragons came close at the end of the half, but could not convert. The second half was much of the same. Both teams found it very difficult to score. Drexel was finally able to secure a goal 18 minutes into the half, off of the stick of Alison McCardell. Towson was unable to answer and the game ended 1-0. The Dragons ended the regular season 8-10, but their conference record is what is most impotent. The Dragons are in a three way tie for 2nd in the conference, and their regular season record will place them in the fourth seed of postseason play. With the fourth spot, Drexel will be playing against James Madison University, who secured the top spot in the conference. It is going to be a tough match-up for the Dragons; the last time these two teams played, JMU took the win with a score of 4-0. Coach Zelenak is absolutely correct, the game still has to be played. While the regular season is important in getting you to the postseason, the statistics in the regular season mean absolutely nothing. Drexel has as good a chance as any team in the CAA playoffs, especially with how they have been playing as of late. The CAA semifinals will be held in Harrisburg, Virginia on Friday, Nov. 6.